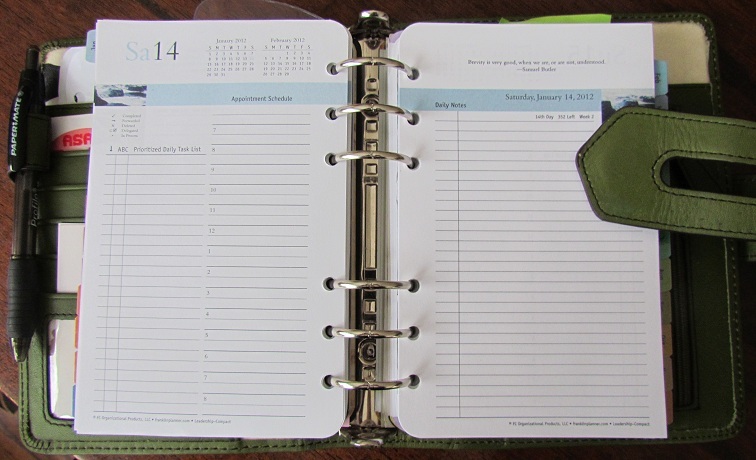 Planner pages don’t have to be used the way they’re designed. If the way they’re designed works for you, great. But if not, do it your way!!! This is Franklin Planner’s compact 2 pages per day. 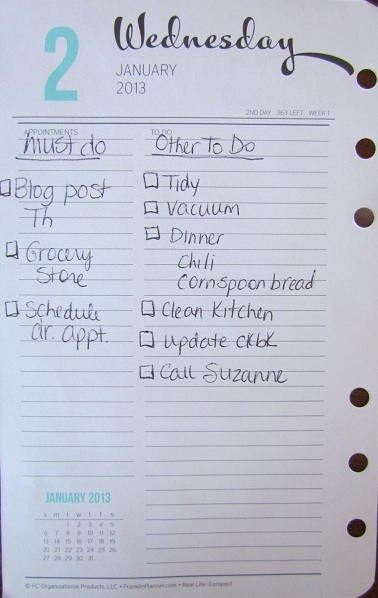 All I did here was skip the lines and the single column and make two lists in the Prioritized Daily Task List area. This works better for me visually and practically. I don’t like writing on those small lines with no white space between items. In fact, I hardly ever use the lines on this page. 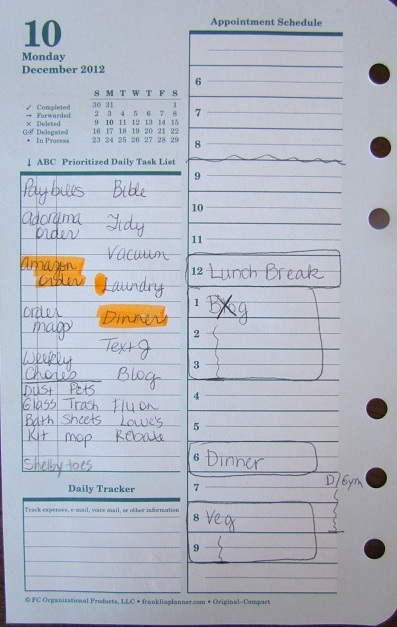 You can use this page as designed with appointments in the left column and to do’s on the right. You can see that I started out using the lines but quickly abandoned them. Instead of using this page as designed, use the left column for the “must do’s” and the right column for everything else. This set-up provides a way for your must do’s to really stand out. And my personal favorite is the divide the page into four horizontal sections for morning, afternoon, evening and whatever you need the last section for. I used it for my menu. Then on the left side of each section put your appointments for that time period and on the right list what you think you can get done during that same time period. The beauty of this method is that you record your commitments first and then think about what time you’ll have left and plan accordingly. I actually love this format because I feel it helps me plan more realistically. When you make a random list of things to do, those things can be out of context, at least for me. Maybe I can do them and maybe I can’t. But this list is much more realistic, and for someone with ADHD, it helps me stay on track, too. So there you go. Combined with the previous article and this one, that’s 10 ways you can use a planner page other than the way it’s designed. What’s your strategy? Are you a by-the-book planner user or do you like to do your own thing? Thank you, Patty! Patty is a new guest blog contributor to the GO Community and we are so excited to learn new tips from her. 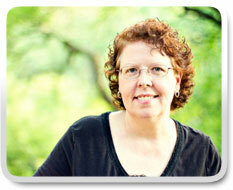 Patty Gardner is a full-time homemaker and writes at Homemakers Daily. The purpose of the blog is to share what she has learned through her many phases of life with others. You’ll find practical, nitty gritty, to-the-point articles to help you in your everyday life as you try to stretch your budget and your time and make a home for your family! I really like the idea of the \”must do\” section. 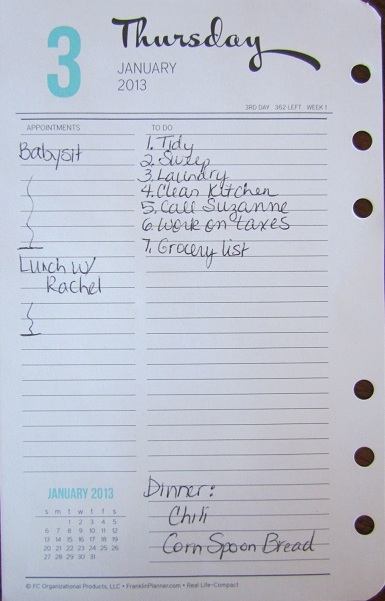 I do the same thing – But I limit it to 5 \”GOT to do today\” items. Five is a great number! I do that sometimes, too.